When it comes to clipless pedals, you have the choice between a three-bolt road-style system, like Shimano’s SPD-SL, and a two-bolt mountain bike-style system, such as Shimano’s SPD, and here we’re going to help you decide which is the best option for you. Check out a whole road.cc forum topic on the subject . Now, although I’ve already described a three bolt system as ‘road-style’, not everyone who rides on the road opts for this type of pedal, and SPDs are certainly not confined to trail use. One other thing to mention up top is that most of the characteristics of Shimano’s SPD-SL system are shared by other three-bolt designs from the likes of Look and Time. Plus, other mountain bike systems are similar in essentials to SPD. We're sticking to Shimano here to keep things simple, but here's a pic of some Look Keo Blade Carbons, just to show we're not biased! Oh, and then there’s Speedplay, a unique system that has many avid fans, although for clarity we’re not going to cover it here. Sorry. If you want to know more about Speedplay, which is particularly valuable for those who need a lot of float, go to our article on 10 of the best clipless pedals. Read our pedal reviews here. Okay, so what are we talking about when we say SPD and SPD-SL? Shimano first released its SPD (Shimano Pedaling Dynamics) design way back in 1990. A smaller metal cleat is mounted to your shoe with two bolts, fitting in a recess in the sole. The recessed cleat makes it easier to walk in SPD shoes and helps guide the cleat into the mechanism, so it’s easier to clip in. Originally intended for mountain biking, SPD has become popular with commuting and recreational riders too who tend to go for inexpensive workhorses like the Shimano PD-M520, above, £20.49). SPD-SL pedals, on the other hand, are quite similar to the original road racing clipless pedals introduced by Look in 1984 and updated many times since. These have a three-bolt cleat that stands proud of the sole, hooks into the front of the pedal and is held in place by a spring-loaded latch at the rear. You can see the mechanism in the carbon-fibre-bodied Shimano 105 R7000 pedals, above which are popular with road riders and will typically set you back about £60. This allows an uncomplicated, rigid sole, but is awkward to walk in; think of a penguin waddling on ice or a sheep on lino and you’re somewhere close. "Our pedals are always developed with particular shoes in mind (and vice versa), so we can give riders a complete pedalling system," says Shimano's Ben Hillsdon. "When making a decision on which to go for it's important to consider whether the shoe and pedal combination offer you the right level of usability and comfort for the type of riding you're doing. One of the biggest differences between the two pedal systems is how easy it is to walk in the shoes, which can have a big impact on a rider's experience and mid-ride coffee stop!" What type of soles are right for you? When you walk in SPD-SL shoes, the prominent cleat is in contact with the ground. Little tips on the cleat provide some protection against wear but you get relatively little grip. Most manufacturers make three-bolt soles as rigid as possible for cycling performance, and that’s far from ideal when you’re not on the bike. Really, you want to keep walking to a minimum: getting to and from your bike, tapping in and out of the cafe, that kind of thing. The £96 dhb Aeron Carbon Road Shoes that we recently reviewed here on road.cc are typical shoes for a three-bolt system. They come with a full-carbon sole that has a 3k weave top layer. “Although it's not the most rigid sole ever, it's pretty damn stiff and there's no sense that your power is being directed anywhere but straight into your pedals,” we said. That’s great when you’re in the saddle, but it doesn’t make for ease of walking. You get very little grip on wet surfaces, while mud and SPD-SL systems really don’t get along. The fact that an SPD cleat sits in a recess means that when you’re off the bike it’s not in contact with the ground nearly as much as an SPD-SL cleat. Manufacturers can give you a treaded sole that’ll grip on various different surfaces. “The grip on the sole is pretty fat, chunky and made from SlipNot rubber tread,” said Jo Burt in his review of Specialized’s £200 two-bolt Recon Mixed Terrain shoes. “There's even a little bit of waffle grip mid-sole should you fluff a clip-in or be a little nervous and need to ride a section resting on the pedal not clipped in, and there are studs in the toe in case any rides see you scrabbling up muddy banks and suchlike. Read our review of Specialized’s Mixed Terrain shoes here. The two-bolt Giro Civila Women’s road shoes (£71.99) that we recently reviewed are designed for more recreational riding. “They are easy to walk in, comfortable for the job and the grippy sole sections offer a much better likelihood of staying on your feet on a tiled or laminate floor than many shoes offering equivalent performance,” we said. Also, although mountain bike race shoes, like road race shoes, have rigid soles, some shoes designed for SPD pedals offer more flex. Giro describes the Petra VR shoes (£43.99), for instance, as “versatile shoes that combine performance riding features like clipless pedal compatibility with the walkability and comfort of light hiking shoes” (the recess for the cleat is covered in the picture below). Check out all of our shoe reviews here. There are many two-bolt touring shoes out there, like Shimano’s RT5s (£67.49 - £80.99, RT stands for Road Touring). Read our Shimano RT 5 First Look. Some two-bolt shoes are designed specifically for urban use, like Shimano’s £61.67 CT5 (CT stands for City Touring) which have a casual trainer style to them along with an EVA mid sole designed to add walking comfort. The more time you’re likely to spend walking, the more appealing SPDs become. So why wouldn’t you want the treaded outsole that an SPD system allows? There’s no point for a lot of us. If you get on your bike and ride until you get home again, or you just stop for a coffee or to nip into a garage for an emergency Snickers, you might as well save a little weight by doing without. Most SPD-SL pedals are single sided, meaning that you can only clip in to them when they are the right way up. With most of the weight at the back of the pedal, they’ll usually hang with the correct side facing backwards towards your foot, so clipping in is straightforward when you get the hang of it. Occasionally, though, bikes do funny things and you might find yourself trying to engage the wrong side of the pedal. Hopefully, no one will notice! Some people find it easier to clip into SPD pedals than SPD-SLs. First, most (not all) SPD pedals are double-sided, so you can clip in to either side. There’s no such thing as having those pedals the wrong way up. Second, the recess in the sole of the shoe can help guide the cleat into the mechanism. In truth, though, you’ll probably soon adapt to whichever system you choose. Shimano Click’r is essentially a variant of SPD with even easier entry and release. You use the same SPD cleats but clipping in and twisting out of Click’r pedals takes far less effort than with standard SPD pedals. You want figures? Shimano reckons it takes 60% less force to clip in, and 50% less force to release. Over on the road side, the R540 pedal is available in a standard model for £26.99 and a Light Action model (£29.95). All of these pedals have spring tension adjustment allowing you to alter the force holding the cleat in place. It’s a simple hex key job that takes seconds. Check out our guide to getting started with clipless pedals. SPD cleats are small and many people find an SPD-SL system more stable, especially when riding out of the saddle. The top-level Dura-Ace 9100 road race pedals (£154), for instance, have a platform that’s 66mm wide. Read our Shimano Dura-Ace 9100 pedal review. However, you can buy SPDs that have a cage around the pedal body to increase the size of the contact area with your shoe. Shimano’s PD-M424 pedals (above, £23.98), for instance, features a resin cage that’s designed to increase foot stability while the PD-M324 pedals (below, £33.49) have an SPD mechanism on one side with a steel platform on the other. Despite being larger, SPD-SLs are a little lighter than SPDs of an equivalent standard. SPD-SLs weigh from 228g (per pair) for race-focused Dura-Ace R9100 up to 330g for R540. SPDs weigh from 310g for XTR cross-country mountain bike pedals to over 500g. A pair of the M324 SPD/flat pedals (above) just mentioned, for example, weighs 533g. People often say that SPD-SLs offer more stable attachment of the shoe to the pedal than SPDs. Is that true? "SPD-SL pedals hold the cleat in three positions whilst the SPD pedal holds the cleat in two positions (fore and aft) to make it easy to unclip in off-road situations." says Shimano's Ben Hillsdon. 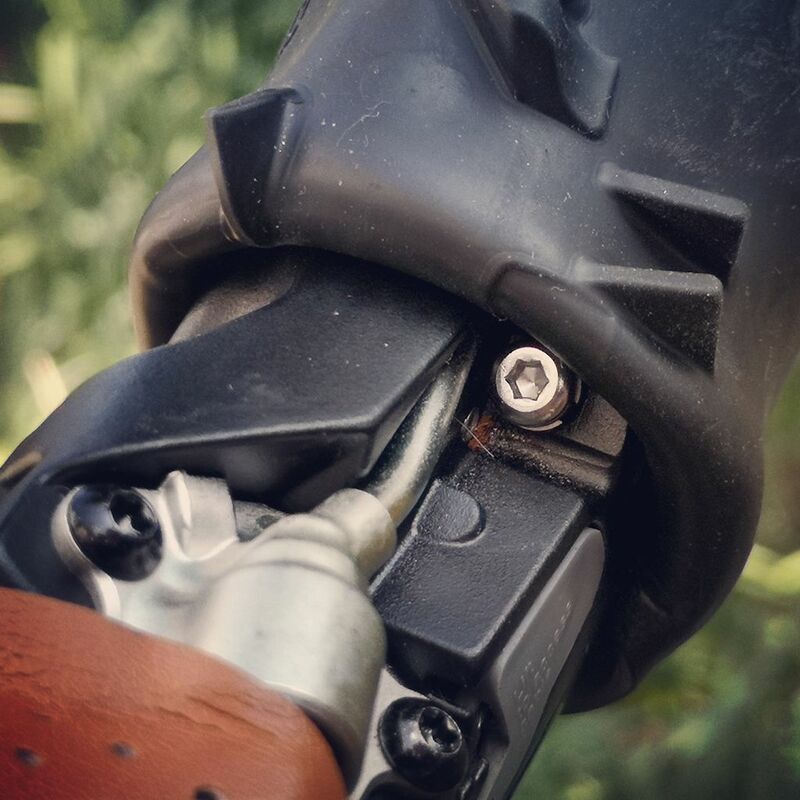 "With both pedal systems, though, the cleat retention (and therefore the stability of the connection) can be adjusted." SPD-SL cleats are available with three different amounts of float (the degree to which your feet can rotate while the cleat remains engaged with the pedal). Cleats with red tips are fixed (0°), blue offers 2° of float and yellow gives you 6°. The fact that they’re made from plastic and they’re exposed (rather than recessed into the sole of your shoe) means that SPD-SL cleats wear out fairly quickly if you walk far in them on a regular basis. SPD cleats are metal and they’re better protected when you walk so they tend to last much longer. They’re cheaper too – £14.99 rather than the £19.99 you have to pay for SPD-SL cleats. SH51 SPD cleats allow you to release from the pedal by twisting your heel outwards while SH56 SPD cleats (above) allow you to disengaged by twisting your foot in either direction. "Common Shimano SPD cleats (like the SH-51) offer at least 6° of float," says Shimano's Ben Hillsdon. "It's worth mentioning that as cleats wear the amount of float increases so it's important to adjust tension on the pedals to reduce unwanted unclipping." SPD-SL pedal prices start at £26.99 for a pair of PD-R540s (above) and go right up to £145 for Dura-Ace PD-R9100s. SPD pedals are a little cheaper than SPD-SLs of a similar level. They start at £20.49 for PD-M520 (above) and go up to £99.99 for XTR-level PD-M9020 trail pedals. Multi-purpose M324 SPD pedals are £32.99. “When I got back into road a few years back I just took the SPDs off my mountain bike and went riding in my carbon soled mountain bike shoes. It was okay but felt wobbly on climbs. I was then persuaded to buy SPD—SL and some mid range road shoes… The difference in power transfer, and more importantly, foot stability/knee tracking, was night and day different. “The physical benefits of SPD-SL over SPD's are the wider platform of the cleat and pedal means there is more lateral stability for your foot on the pedal. “The single sided nature of the SL also reduces the profile of the pedal allowing you to pedal marginally deeper into a corner. A proper road shoe has a stiff sole all the way to the tip of the toe giving a more stable base, whereas in most MTB shoes the carbon or nylon stops just ahead of the cleat to allow the sole to bend slightly at that point, to aid walking as often required in MTBing. “Road shoes are generally lighter as they don't have tread and reinforcements, so a slight reduction in rotating mass. “Having learned to ride clipless with SPDs, I thought I should try SPD-SLs on my road bike. I never got on with the clipping in on the SLs. Partly this is because it is much easier clipping in to double-sided pedals, but this is not the only factor - I ride A530 single-sided SPDs on my commuting bike, and even these are much easier than the SPD-SLs, even though they are not double sided. “I was also really unimpressed with the wear on the plastic SPD-SL cleats. I made a real effort not to walk in them, and they still rapidly wore down such that I think I would have needed to replace them at least twice a year, and they're not cheap. I only switched to road pedals, because there are no powermeter pedal options with SPD. Personally I don't notice any difference in power transfer with the bigger platform. Weight differences are also minimal. Clipping in and walking with road shoes is also a lot more awkward. As soon as there are SPD power meters I am back. I might also switch back for the cooler months, as I have some nice winter SPD shoes and I am not going to buy new ones just because of the pedals. Yep- I am just a bit behind you timewise. About, somewhat reluctantly, to buy vector 3's but if there was an spd equivalent I'd have'em in a flash. I wonder how many roadies would have to use spds before a manufacturer would produce a lighter pedal? I'd be willing to pay a premium for something like a dura ace level equivalent. Bet I'm not the only one either. I recently bought some stiffer soled SPD shoes (stiffer than my commute shoes by far), ratchet strap so can get nice and snug, not as stiff as my full carbon soled road shoes but really not a massive amount of difference 90% of the time and able to walk wherever. the whole wider platform thing with road pedals i think is a load of guff, if you're using very stiff soled road shoes then its where the cleat is in contact with the pedal/shoe that counts, not the rest outside of this contact patch as the stiff sole is not exerting much if any pressure on the pedal outside of that. Added stability, hmmmm, i can't say I've had stability issues with any road shoes or even very narrow/small single sided SPD road pedals. Am I the only one who switches to SPD pedals in the winter due to all the extra crud on the road and for when nature calls and you have to run into a muddy field? I use Speedplay the rest of the year but given that it's quite sensitive to crud, I'd rather use a system that's bulletproof and designed to work in muddy conditions. Winter rides are about going out in the first place, not setting PB's so I don't mind having a bit less power. SPD all the way. The only issue is that they are too cheap so you can't um and ahh over the cost before "reluctantly" dropping a fortune on something you can never "justify". The most expensive ones I could find are Crankbrothers EggBeater 11 Pedal - 2017 - silver/gold for 450€ retail. The most expensive ones I could find are Crankbrothers EggBeater 11 Pedal - 2017 - silver/gold for 450€ retail. Reasonable I would say. and for when nature calls and you have to run into a muddy field? Did that one night recently on the way home and couldn't clip in fully, when I tried to pull up I pulled out of the pedal. I don't know where Road.CC buys their pedals from cause the maximum I've paid for M520s has been £25 if you look and wait for the right price, the best I paid was £15 for a brand new pair but they didn't have cleats. I prefer the cheaper pedals over the more expensive ones cause of cost and the fact they have a 6mm allen socket AND 15mm flats on them, dearer Shimano pedals just have an 8mm allen socket on them. The tie-breaker for me is spin class. Those stationary bikes have SPD pedals and I can use my hand-me-down road shoes for a few more years. Again, very good article , not much to add. I used to say that anything more than M520s was just bling, then I found I kept missing the pedal on my full-suss when the trails got rowdy, so it now, justifiably, has Nukeproof Horizons which work perfectly with my Specialized 2FOs, SPD plus a big pinned platform. #dontbesucharoadie plastic cleats are a jok£ and you buying them is the punchline. Slight correction on the SH56 multi-release SPD cleats: They will enable release by sliding your foot sideways off the pedal, in addition to twisting your ankle out. That's not something you can do with the single-release SH51 variety. Oh you're just such a wag, that's me told ! Anyway, what are you doing on clips on your full-sus roadie ? Trying to not die! I like the flexibility of a nice chunky pedal and being able to clip in, best of both. I was going to wait for SaintPDs but I heard bad things about their spindles and good things about Nukeproof. SPD's on the gravel/adventure bike so I can walk around in the shoes, which means I only have to take one pair when bikepacking. SPD-SL on the road bike for a lighter shoe with a much stiffer sole. Anyway, what are you doing on clips on your full-sus roadie ? I've only ever used SPD's and they suit my riding requirements - they do however creak which drives me insane. I've never managed to find the exact cause, but a couple of drops of silicone lube on the cleaats before each rides keeps it under control, but only for 30 miles or so, when the inevitable creak returns. If I turn my foot slightly it will stop, but that isn't the solution. Don't forget either, Shimano pedals are so easy to service. Every couple of years, unscrew and remove the axle mechanism, clean as much of the old schmig off the axle and from inside the pedal as you can and simply squeeze 3/4" of new grease into the pedal, bang on a hard surface a few times so the grease goes down the hole and screw the axle back in. The new grease squeezing up through and out of the pedal will purge the old grease from the bearings and replace it with new. Not full service as such but will replace all the old grease and contaminants. As a commuter I recommend SPD over SPD-SL. I started riding the latter and recently converted. Already I find clipping in much more intuitive with SPD. I have not noticed any significant difference in "feel" despite the much smaller platform of the SPD pedal. SPD-SL in winter are downright hazardous: slushy snow gets into the cleat and instantly compacts, meaning you can't get clipped back in. One thing I would recommend if you prefer SPD-SL is to invest in a pair of the cleat covers. They significantly prolong the life of your cleats even if it's just a short walk you do from bike to workplace. It is one extra faff (another reason for preferring SPD) but worth it. And if you're trying any type of clipless pedal for the first time take yourself somewhere quiet and traffic free and practice first. Be prepared for a fall or two while you learn! Unless you're using SPD's with SH56 cleats in which case you'll never fall over. Ever. Basically it asks the question "Is there any advantage of Look/SPD-sl/Speedplay vs SPDs"
Also his whole series is really worth looking through. I think the small grains of sand from the dirt they collect "by design" make SPDs creaking. I used to think the culprits were the muddy cleats, but switching to the other side of platform usually stops creaking for a while, so they could not necessarily be the reason. SPD all the way for me. Never could work out why I had to buy all new stuff for road biking. Though I do use Shimano A520 pedals. SPD/wide platform/low profile/shiny/cheap/wear well and always hang exactly right to kick in - suits me. I'm just an old slugger though - super light gear and 'stiff' shoes don't do it for me. It’s as simple as I’ve chosen one system to fit all of my shoes to all of my bikes. Or reverse. Speedplays. Expensive. Can jam if lots of mud gets in. Require servicing (well, lube on the cleats, grease injection every six months for the pedals). Unusual shoe bolt pattern. But despite those disadvantages, they’re still a lot better than SPDs or SPD-SLs. And the "can’t walk in them, cleats wear fast it you do" problem has been fixed with the walkable cleats introduced a couple of years ago. Got SPD for my roadbike to replace SPD-SL having used these for 3 years. Have used SPD on hybrid bike for rides up to about 30 miles, no issues. Same MTB shoes used on the roadbike. My feet hurt a lot over the 2-3 rides I endured. No idea why this happened. Put the SPD-SL's back on the road bike, pain in feet for a week or so. Now ok again. I'm confused! The shoes are middle-of-road with carbon re-inforced nylon soles, stiff but not super stiff like full carbon soles. Maybe that's why. I think both systems are excellent. But I do prefer SPD-SL for long rides. They 'feel' better and I find them more comfortable. The SPD's I have are the hybrid model, flat on one side. Big advantage is that you can use normal shoes also and that the cleats last forever. With SPD'SL's, they'll do fine for a year or so. I've got T8000s on my road bike - platform with pins one side, SPD the other. Lovely pedals, even have reflectors and yet still manage to not look completely dreadful. Tourer/Gravel/Shop/Pub bike has DMR V12s - brilliant for off-road stability but they cause issues with toe overlap now I'm running 40mm tyres on that bike. Might need to go to something smaller, but will still be flats so I don't trash my road shoes (Shimano MT5 - a bit clunky but essential for the muddy lanes that count as tarmac around here. I've never tried SPD-SLs - my feet don't seem to get on with ultra-stiff shoes.